May’s Toastie of the Month! It only takes a handful of ingredients to create a flavourful, comforting lunch for a cold day. Its grilled cheese, but for grown ups. 1 Preheat a frypan on medium heat, and spray with non-stick oil. 2 Fry the haloumi in the frypan until golden brown on both sides. Remove from pan squirt with lemon juice, season and set aside. 3 Working quickly (so haloumi will still be soft and hot), add a knob of butter to the pan and lightly fry the bread on both sides until golden. 4 Remove the bread from the pan, and spread each piece of bread with pesto. 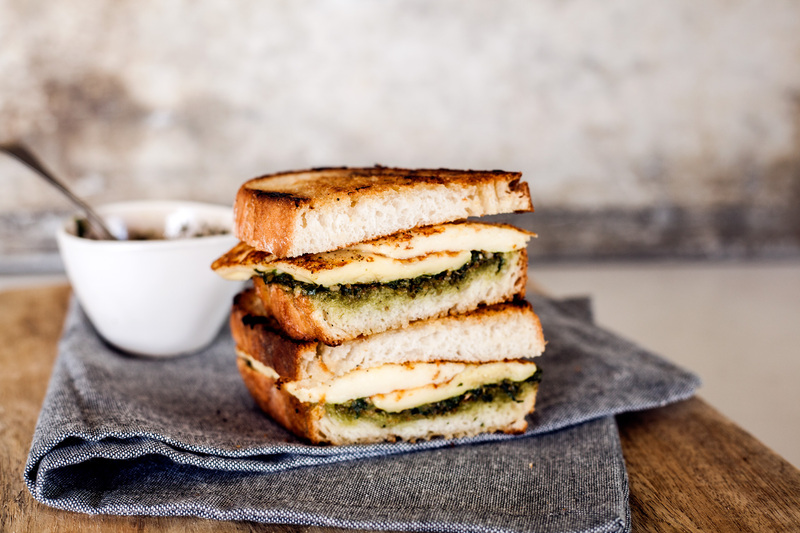 Add the haloumi slices and form a sandwich. Enjoy while hot! Light and Fluffy Lemon Biscuits with Lemon Glaze made with Smooth Ricotta. A delicious afternoon treat with a cup of tea or shot of espresso! A blueberry, honey and chia seed smoothie with 1/3 cup of smooth ricotta which adds protein and a delicious creamy consistency.